Jul - 14 | By: OMPA | one comment. 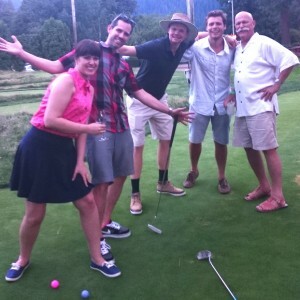 Governators Lisa and Nathan Cherrington (pictured with Will Vinton and members of his team The Vintones) defeated all comers to win the 1st Place in the OMPA Classic croquet tournament, powered by Zarr Studios. The no requests necessary DJ Pan Am warmed up a party so bright that it torched a bonfire and 18 holes of glowing putt-putt. The party ensued until the security came and attempted to shut it down. The association says they are still determining what authority the chief of security has to enforce noise ordinances in unincorporated areas. However, in respect to the local community the musical portion of the event did conclude at 10pm. The appearance of the po-po did not dissuade the Oregon independent production community dance tribe (led of course by Ms. Jacqueline Gault) from doing their own, often weird, thing. It is reported that some golf teams may have gotten lost on the sprawling golf links, which is unfortunately not uncommon on the course at The Resort in Welches. Photography to document the days events may be uploaded directly to, and viewed at, the various Facebook posts covering the event, including shots from Cine Rent West’s Photo Hole. Steve Dorsey contributed as auctioneer to help the association raise much needed funds for itself and for its Media Arts Education scholarship. OMPA is the trade association for Oregon’s commercial, film and television production industry, including motion pictures in the form of video games, web apps and advertising. It was at last year’s OMPA Classic at which the legislative gains made by the trade association — in the form of tax credit funded filmmaker recruitment dollars — were officially announced. This year the mood was jolly with increased business opportunities throughout the region. Thanks to the increases to the Oregon film incentive earned by OMPA and their allied partners, the projects producing in Oregon have multiplied, with those in production or soon-to-be producing including another animated feature and shorts by LAIKA as well as Bent Image Lab, Season 1 of The Librarians (Electric Entertainment), Season 4 of Grimm (NBC Universal), Season 5 of Portlandia (Broadway Video), feature films Brother-In-Laws (Broadway Video) and Green Room (Film Science), two Oregon-based TV series Mother F#@*er (Alliance) and Combat Report (One-Eighty Films), and Oregon indie films Something Like Summer (Something Like Summer, LLC), Tracktown USA (Bay Bridge Productions) and SEED: The Untold Story, a documentary by acclaimed Collective Eye Films. This year, thanks to OMPA’s work, the film incentive now includes incentives for video games which helped incubate the titles Godzilla Live and three other yet-to-be-released games by Pipeworks Software in Eugene, as well as titles from Chroma Games and Fullbright. Organizers say the only downside of all this business and the resulting Oregon man-hours was that event attendance suffered as a result of the busier local economy. “With three television shows and other projects shooting at the same time, it is hard to get a crowd to come out on a Friday,” says OMPA head Tom McFadden. Even with that, the event brought almost 200 people to The Resort in Welches, some even via the association’s chartered luxury shuttle sponsored by Lucky Limo which left from the NE Portland location of computer seller TD Curran. Stars of all stripes were out in full force at the OMPA Classic powered by Zarr Studios on Friday, July 11th, 2014 in Welches, Oregon. 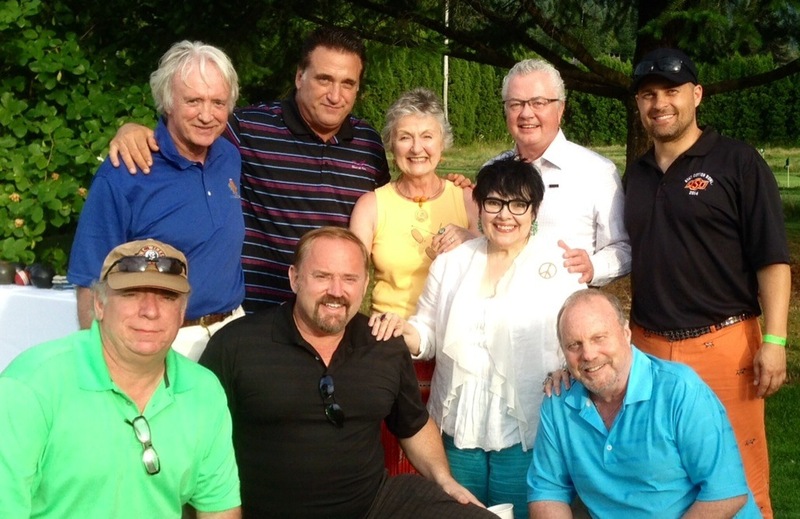 Pictured here are stars of stage and screen Jesse Lee Vint, Daniel Baldwin, Suzanne Owens-Duval, Brad Anderson, Jamie Vert, Hank Cartwright, Duane Hanson, Michele Mariana and Danny Bruno. All either represent or are represented by the SAG-AFTRA union. Bruno, Cartwright and Baldwin have each made appearances on Grimm, which is now started shooting its 4th season in Portland. What a fun looking event! Looks like a great way to celebrate with folks in Oregon’s media production industry.